Don’t you wish you were on that boat speeding across the brilliant sapphire water and heading to a remote tropical island with your special someone? That sure is possible if you were in the Caribbean and have lots of dough but for humble commoners like a majority of us, a cruise ship is a cheaper alternative to enjoy the high seas and to explore these exotic islands. I have been cruising regularly for the past 5 years and I enjoy visiting multiple places minus the inconvenience of dragging around my luggages. The only thing I like to drag around is my camera, which then allows me to capture so many interesting places. The photograph above was taken from my stateroom balcony a few hours after we docked in St. Thomas, US Virgin Islands. Unfortunately, the island and the boats didn’t really provide much for my composition until the speedboat came slicing across the water. I like how the speeding boat added a sense of excitement and adventure to my composition. It makes me want to book and hop on another cruise. 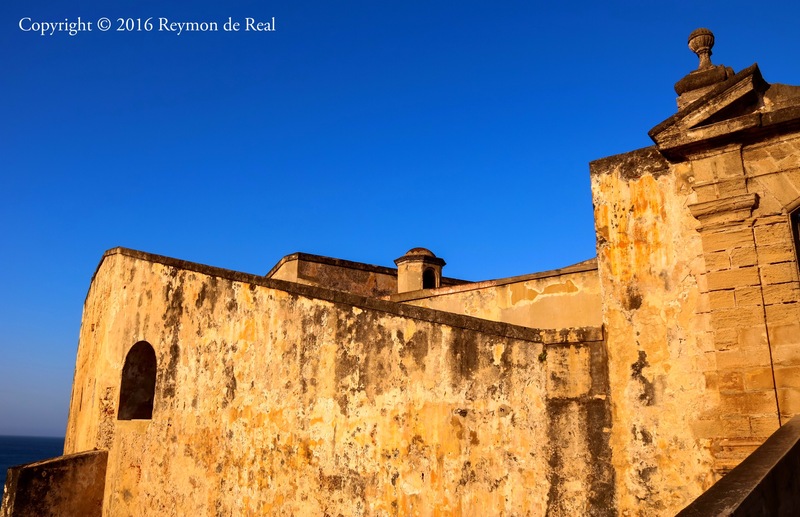 The thick walls of the Fort San Cristobal in San Juan, Puerto Rico protected this former Spanish settlement for centuries from foreign invaders. This once military complex is now a museum under the United States National Park Services and is one of the most visited heritage sites in Old San Juan. Last February, the Eastern Caribbean cruise I was on made a brief stop at this US territory giving me ample time to explore the neighborhood close to the port. The fort was conveniently located a few minutes from the ship so I braved through the humidity and found myself standing in front of this behemoth of a wall. At the gate, I noticed the golden light of the setting sun casting geometric shadows while making the walls glow creating an interesting photo opportunity for me. The rich blue cloudless sky also made the golden yellow walls of the fort pop out in this photograph. Unfortunately, my cruise only stopped for a few hours so I never really got to explore much of Old San Juan. I hope to visit again someday and maybe include a visit of the El Morro for more photo opportunities. The composition of this photo is very similar to those postcards they sell at souvenir shops that I personally think it looks kinda cheesy.😁 However, I didn’t take a lot of photos while at St. Thomas so you will have to bear with this one. 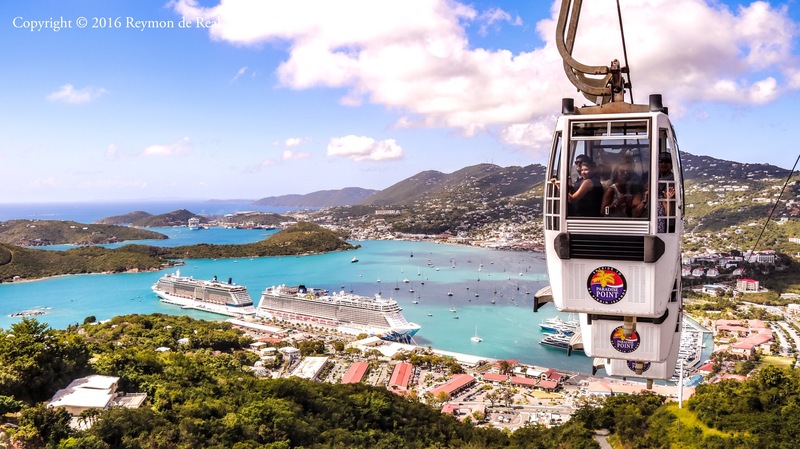 The St. Thomas Skyride is a $20 ride up a mountain on these scary looking cable cars and at the summit is a restaurant and bar as well as a few souvenir shops offering an amazing view of the island. I took this photo just as the cable cars were approaching interestingly adding a focus to my composition. Unfortunately, I was not able to explore the island as it was so hot and humid that I decided to go back to the ship immediately after I stepped out of the ride.